The 2018 draft of the Montgomery County Bicycle Master Plan is located right here. Follow the two “Download” links on that page to see the main document and the appendices that make up the plan. See also the plan map. 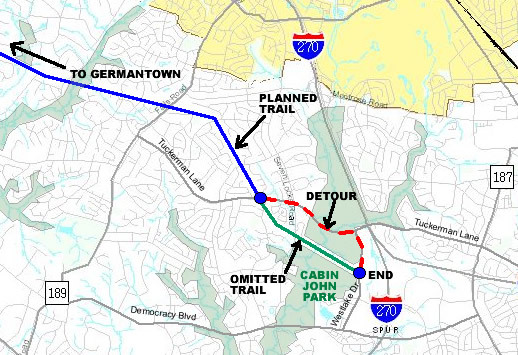 For a full discussion of the PEPCO trail issue raised by Montgomery Bicycle Advocates, see here. The official public comment period on the plan is over, but you can still let the Council know your concerns as long as you don’t wait too long (mid to late October to be safe). The Council is now conducting worksessions to decide on any changes to the plan. Then they’ll approve and adopt the plan and it will become official. You can send any concerns to the County Council via email at county.council@montgomerycountymd.gov. For more Council contact info, see the full Council web page here. The new draft of the Montgomery County Bicycle Master Plan is about to go before the County Council. Please let the Council know you support the plan and tell them how it can be improved. Express your support at the hearing or in writing by July 10th. The draft plan is an excellent template for the future, representing a paradigm shift towards “low stress” bikeways like protected bike lanes (cycle tracks), shared use paths, and bicycle boulevards. The proposed network of low stress bikeways will attract more people who want to bike but are afraid of riding too close to cars. This will increase the number of people out there on bikes. BUT WHERE ARE THE SHOULDERS? It’s an excellent plan. We should all support it. But it does have a few issues that should be addressed by the County Council. Notably, the plan omits a great many bikeable shoulders and conventional bike lanes that are used by cyclists in the county today. The plan ascribes too little value to these so-called “striped bikeways” on busy roads, because it does not consider them to be low stress (they’re called “striped bikeways” because a real or implied stripe rather than a physical barrier separates bikes from cars). 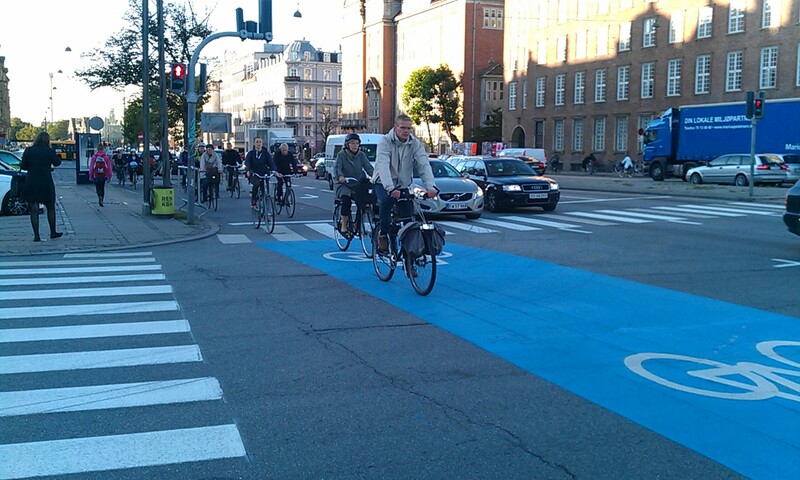 In a sense, the plan marginalizes confident cyclists who want both safety and efficiency – the “power users” of the bike network – who are often best served by striped bikeways. In most cases the plan doesn’t call for existing shoulders to be retained – even when it’s feasible to retain them AND provide a low stress option. Many experienced cyclists rely on shoulders (and conventional bike lanes) because they provide some separation from busy traffic, but are often faster and more convenient than protected bikeways and sidepaths. They allow riders to maintain continuously higher speeds, maintain right-of-way at intersections, and ride where they’re more likely to be seen. Protected bike lanes, on the other hand, can make it harder to exit and re-enter the bikeway, which cyclists may want to do to get around pedestrians and obstacles, make quick left turns, avoid right-hooks at intersections, or avoid cars with their noses sticking out, among other reasons. When placed behind parked cars, protected bike lanes invite pedestrian conflicts and reduce visibility, making it dangerous to ride too fast. Yet they still expose cyclists to traffic at intersections. Sidepaths are even more problematic at intersections, and most importantly, they must be shared with pedestrians. Path cyclists must keep speeds down and always be concerned at side street and driveway crossings. Not specifying existing shoulders in the plan also makes it less likely they’ll be improved (by filling in short gaps, for example). It’s still very important to provide low stress bikeways. So the solution, wherever shoulders have value, is to provide both shoulders (or conventional bike lanes) AND a low stress bike facility along the same road. The low stress element would likely be a sidepath or a two-way protected bike lane on one side. In some cases the shoulders may allow parking. The Planning Department’s primary objection to dual bikeways is that providing shoulders or conventional bike lanes could make it more difficult to implement the low stress bike accommodation. But I’m recommending dual bikeways where they’re likely to be feasible. For some other roads I’m asking for what I call a “qualified dual bikeway”, meaning that if both bikeway types can’t be feasibly implemented, then just provide the low stress bikeway. This idea was rejected by planners, who seem afraid that any mention of the striped bikeway option could lead implementers to choose that and only that. The resistance to dual bikeways seems rooted in distrust of DOT — a belief that DOT will disregard the plan and use the dual designation as an excuse not to build the low stress component. My response is that I don’t trust DOT to do what’s NOT in the plan — because, after all, it’s not in the plan. 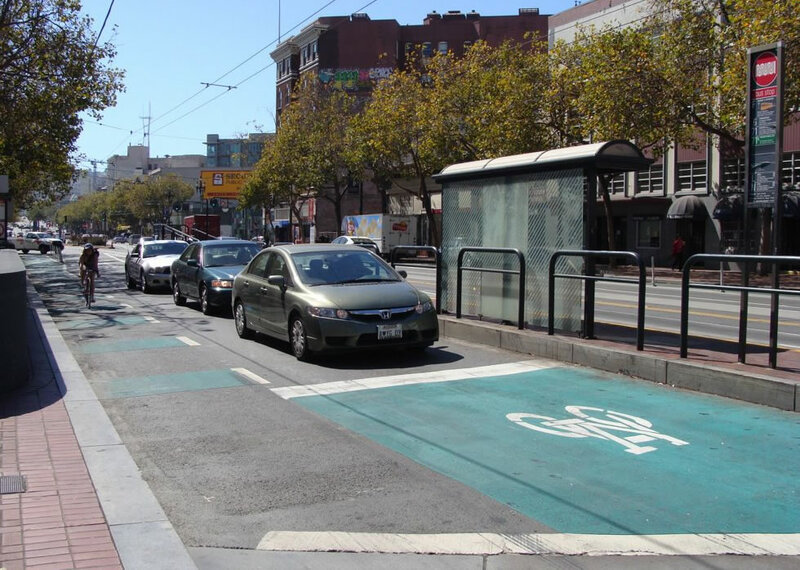 The Bicycle Plan notes that bikeable shoulders or conventional bike lanes “can” be provided as long as they do not substantially detract from the accompanying recommended low stress bikeway. I’ll work to make sure this becomes the policy of Montgomery County DOT and Maryland SHA. But it’s a weak guarantee. The plan should still stipulate these elements road by road, so it’s clear to everyone from DPS supervisors to DOT engineers to the next round of planners that these facilities are worth providing. I don’t see how this could be interpreted as a green light to ignore the plan’s low stress mandate, repeated over and over in the document. Below are my recommendations of what needs to be added to the plan. Here’s a prioritized list of the high priority roads where shoulders or conventional bike lanes should be explicitly specified in the plan in addition to a low stress bikeway. All of these roads have shoulders or conventional bike lanes already. (I’ve omitted roads where the Bicycle Plan already recommends shoulders or conventional bike lanes). Tuckerman Lane (Old Georgetown Road to Falls Road) – A vital and popular route for road cyclists. Planners propose to replace the shoulders with protected bike lanes, when the best option is to add a sidepath and keep the existing shoulders. DOT is already designing improvements. MD 28 (Darnestown Rd/Key West Ave) (Seneca Rd and Shady Grove Rd) – Plan would remove shoulders from two segments – here and here – or about 3 out of 6 miles. This rare road route to Darnestown already has both shoulders and a sidepath. Planners want to eliminate the shoulders to widen the grass buffer, which would not actually increase the distance between the path and cars. Briggs Chaney Road/Norwood Rd (Automobile Blvd to Layhill Rd) – An important road biking route connecting the Rt. 29 corridor to the Olney area. It includes a short segment of New Hampshire Ave. Shoulders may need a few improvements. Knowles Ave (MD 547) (Beach Dr to Summit Ave) – This connects to the very popular Beach Drive and also forms part of a signed bike route from North Bethesda to Wheaton. At least provide a shoulder going uphill (a climbing lane). Kemp Mill Rd (Arcola Ave to Randolph Rd) – DOT specifically striped this as a shoulder bikeway and there appears to be room to add a path as well. Bells Mill Rd (Gainsborough Rd to Falls Rd) – These bikeable shoulders are needed to fill in for the Democracy Blvd shoulders that would be difficult to improve. Ridge Rd (MD 27) (Brink Road to Damascus High School) – Good shoulders with pocket bike lanes already exist for a significant length of this segment, and there appears to be room both this and a path. 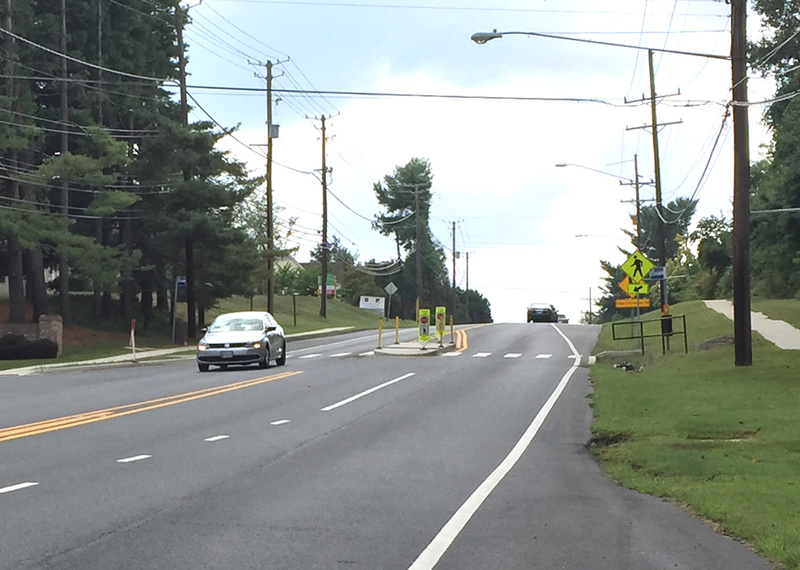 Dufief Mill Rd (Travilah Rd to Darnestown Rd) – Currently has bike lanes and it and links to MD 28. 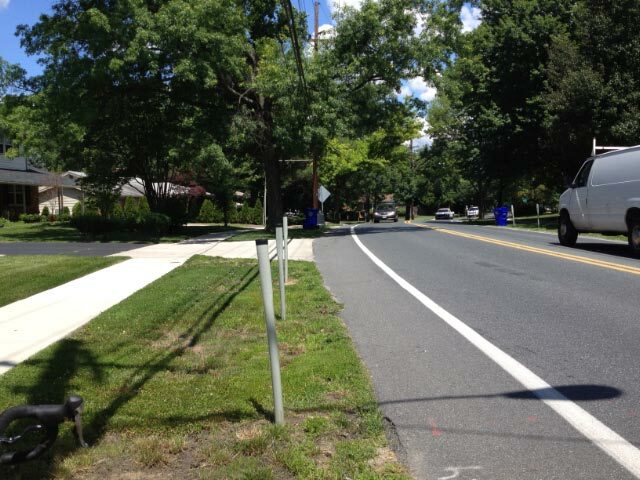 Fairland Rd (Old Columbia Pike to East Randolph Rd) – Has fast shoulders that get frequent use, but space may be tight. Plyers Mill Rd (Lexington St to Amherst Ave) – This is part of a signed cross-county road route (along with Dennis Ave, Tuckerman Lane and Knowles Ave). Protected bike lanes may work where shoulders aren’t adequate. Massachusetts Ave (MD 396) (Goldsboro Rd to Sangamore St) – Good shoulders but space is tight; at least provide path and uphill shoulder (climbing lane). Montrose Rd (Seven Locks Rd to Falls Rd) – Already has shoulders, needs a path. River Rd (MD 190) (Ridgefield Rd to Norwood School main entrance) – This already has bikeable shoulders, with the portion east of I-495 marked as bike lanes. 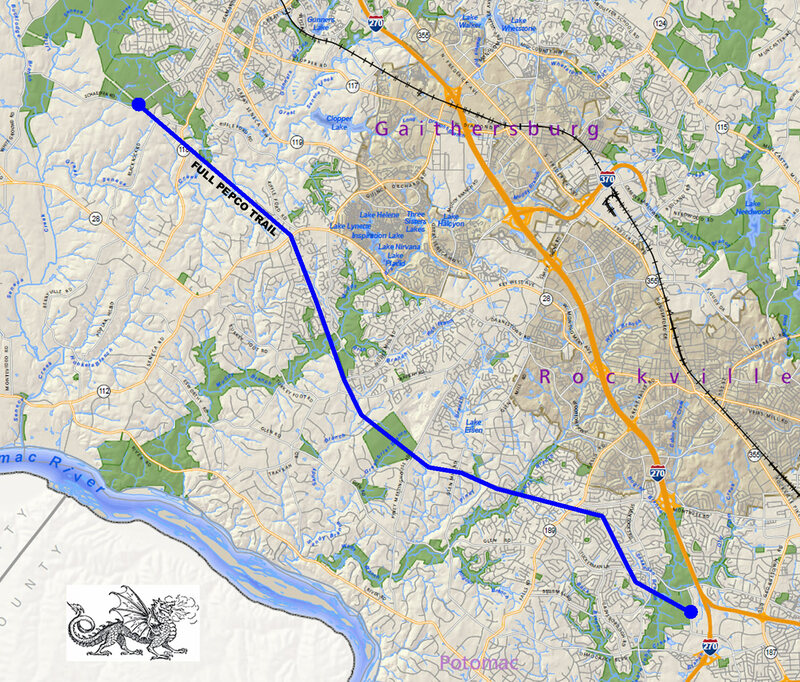 It would benefit from better striping near I-495. Woodfield Rd (MD 124) (Lindbergh Dr north intersection to East Village Ave) — State road. Clarksburg Rd/Stringtown Rd (roughly Dowitcher Way to Frederick Rd) — Partially a state road. Cherry Hill Rd/East Randolph Rd (Prosperity Drive to Old Columbia Pike) – County road. Richter Farm Rd (Great Seneca Hwy to Germantown Rd) — County road. Dawson Farm Rd (Great Seneca Hwy to Germantown Rd) — County road. For the following roads, shoulders exist and only a shared use path is recommended in the plan. Either keep the shoulders (and fix pinch points) or provide protected bike lanes, but above all, a path should not be the only bike facility. Dennis Ave (Georgia Ave to Sligo Creek Parkway) – Same comment as Plyers Mill Rd. Robey Rd (Briggs Chaney Rd to Greencastle Rd) – Has very wide lanes. 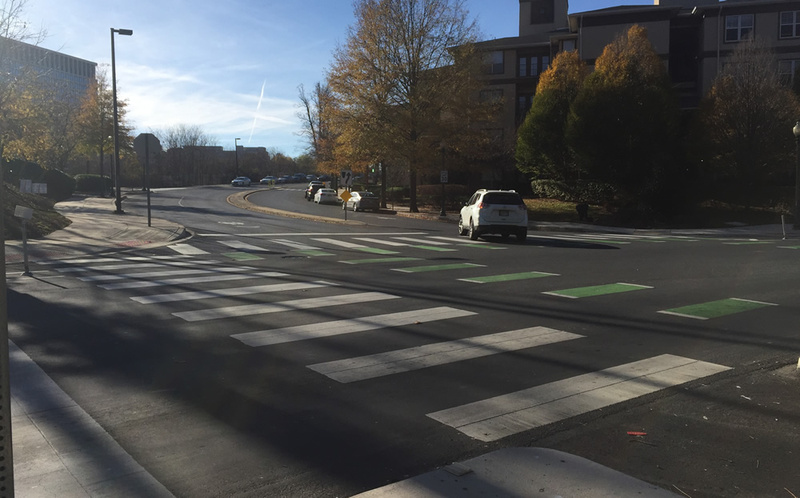 Old Columbia Pike/Prosperity Dr (Industrial Pkwy to Cherry Hill Rd) – Has very wide lanes. Little Falls Parkway south of the Capital Crescent Trail crossing has existing shoulders but isn’t planned as any kind of bikeway in the Bicycle Plan (because the CCT is parallel, more or less). The plan should just recommend what’s already there (shoulders) but remain flexible. 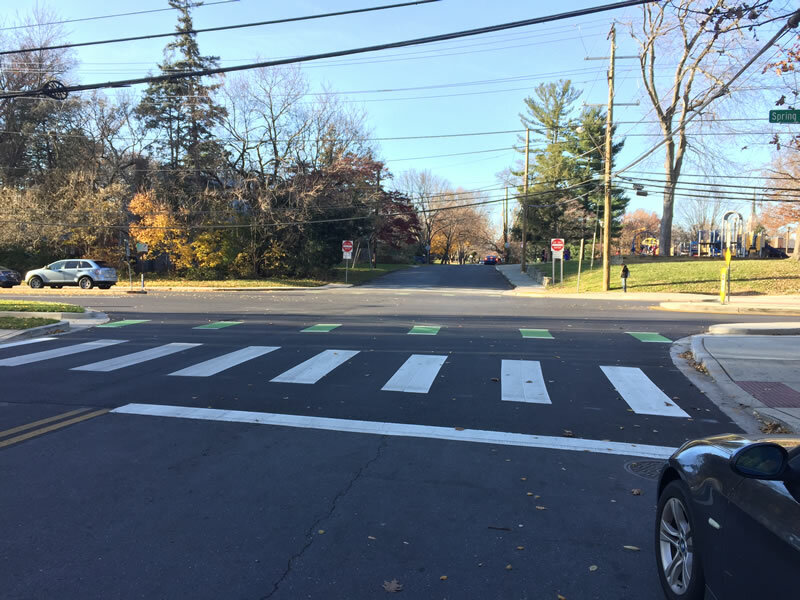 Little Falls Parkway north of the Capital Crescent Trail crossing is likely to be reconfigured due to the crossing fatality. The bike facility should include a shoulder on the northbound side. The temporary southbound configuration is a sidepath transitioning to a de facto two-way protected bike lane, which seems to work given the unique layout. But the trail intersection is being redesigned, so the Bicycle Plan should be flexible. In rural areas, the plan proposes bikeable shoulders on several more roads. It does this almost casually, covering many roads where there’s little hope of adding shoulders, like Seneca Rd or rural Clarksburg Rd. Rural Montgomery County can be a conundrum for road cyclists who don’t want to “take the lane” on fast roads – full of missing links and few comfortable ways to get there by bike. At least the plan calls for retention of what shoulders already exist in rural areas. Sometimes I feel as if there’s a defensive posture in bike planning circles due to resistance planners must have received from avid cyclists when protected bike lanes were first proposed — resistance based on the notion that cycling is easier and safer when you’re not trapped along the edge of the road, possibly going in the wrong direction. Years of being told to “get on the bike path” can make bikers grumpy, and then to hear it from bike planners, well, that couldn’t have gone over well. Defensiveness can lead to fear of any messages that could be construed as distracting or mixed — messages like shoulders have value or dual bikeways are a good option. In the new draft Bicycle Plan, neither the objectives, metrics nor road-by-road recommendations pay much heed to the value of facilities that aren’t defined as low stress. But I shouldn’t be too critical. The plan authors did add a nice statement in the plan that truly acknowledges the value of shoulders (a statement I submitted by the way), which I appreciate. But I’m concerned that this plan (and almost every plan I’ve seen touting protected bike lanes) characterizes research data in a way that dramatically understates the percentage of likely cyclists who are confident riding in shoulders. That’s a sign that people might be trying just a little too hard to push for their favorite facility type. But then, we’re all zealous from time to time or we wouldn’t be good bike advocates! 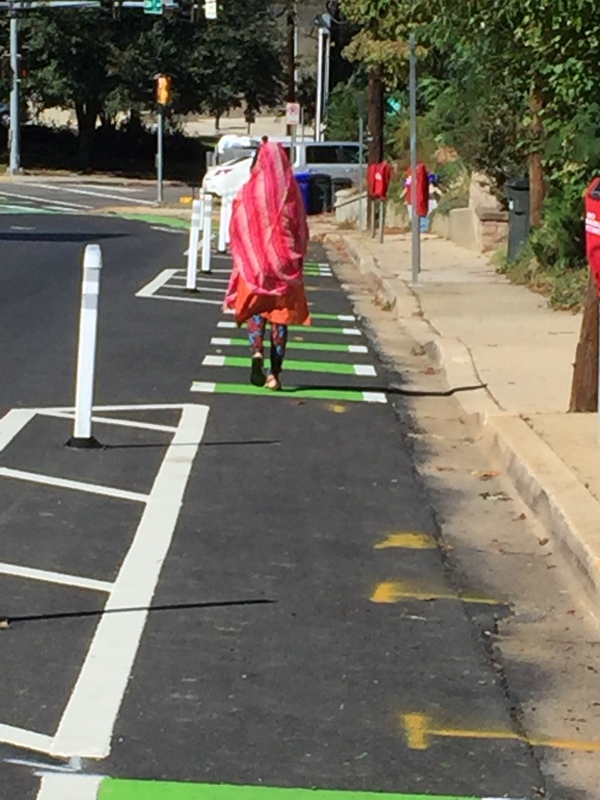 Not long ago, there were no protected bike lanes (aka cycle tracks) in Montgomery County, but now there are three, with more are on the way. 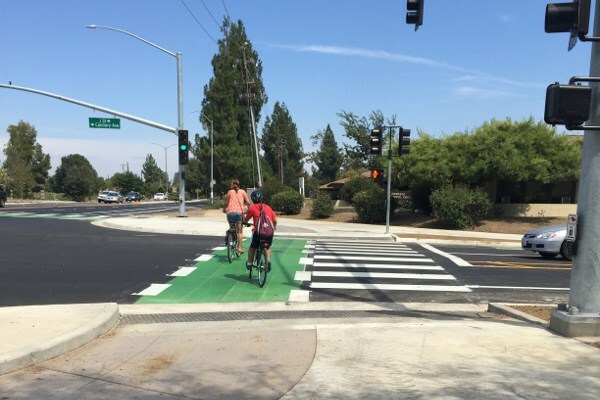 As a result, county bikeway designers are faced with many decisions they never had to make before. How should PBLs be separated from the street? How can cyclists make left turns? And so on. 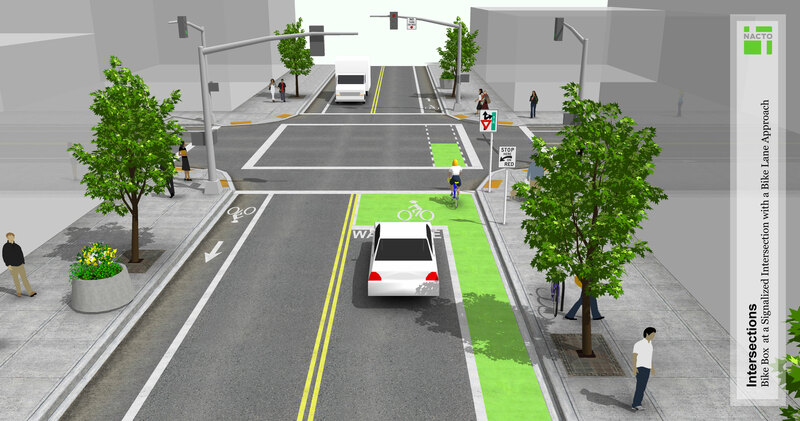 What should protected bike lane crossings look like? 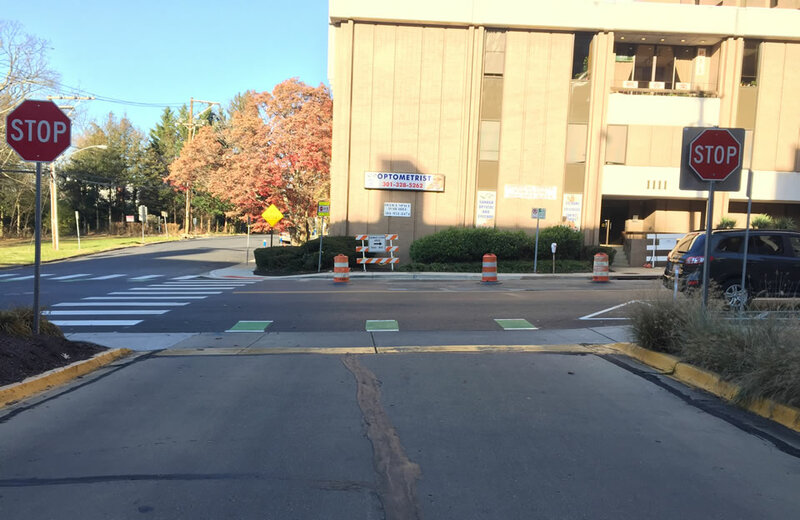 Montgomery County has decided to use the floating bar design for all new protected bike lane crossings. But I believe solid painted designs are far superior in most contexts. My first concern is that floating bars do not visually define or declare the crossing as well as a solid area does. Solid crossings aren’t merely visible; they are bold and conspicuous. A solid area literally resembles a path crossing the street. So a solid area does a better job alerting drivers that they’re coming to a bikeway, and drivers who see it as a bikeway are more likely to look for rapidly approaching cyclists. 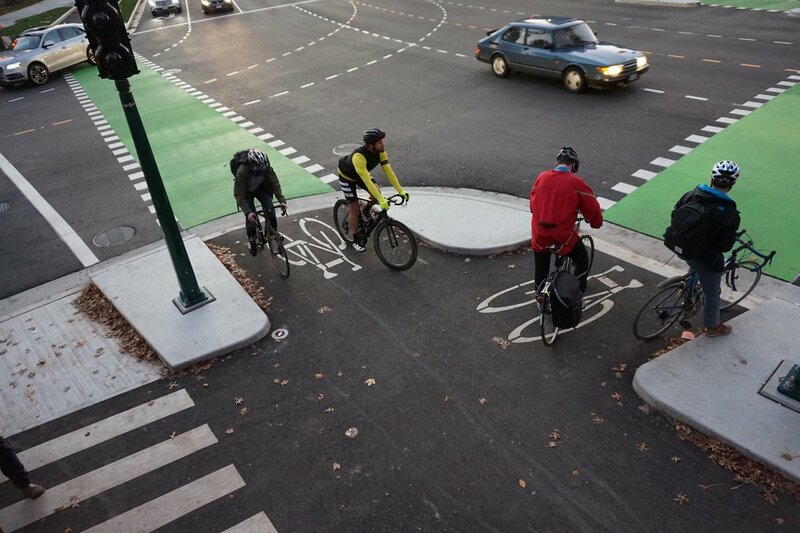 Drivers who see it as a bikeway are more likely to stop before the crossing rather than on top of it. 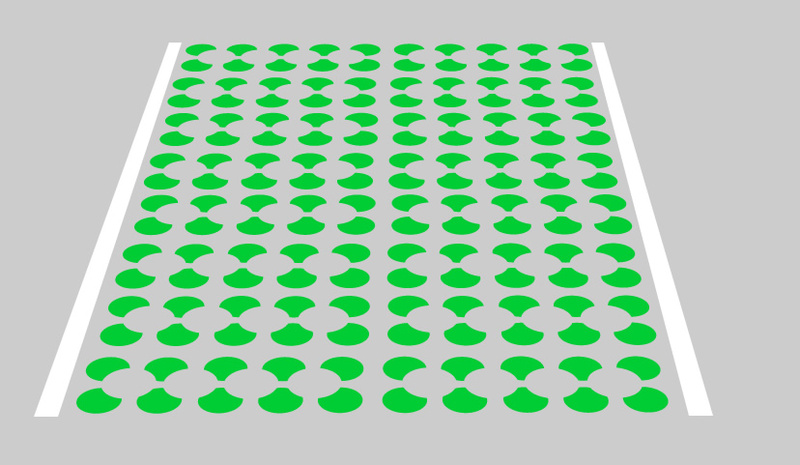 Drivers are often hesitant to stop on top of large painted areas in any case, based on my observations. The edges of solid crossings are better defined, less “permeable” so to speak. We all know that drivers don’t take barred crosswalks seriously enough, often pulling across them before stopping if they stop at all. My second concern is this: Intersections with protected bike lane crossings also typically have crosswalks, which can result in a virtual flotilla of floating bars. All the bars can be difficult for drivers to decipher in a few seconds. One barred crossing by itself might be easy enough to process, provided the bars aren’t too far apart. 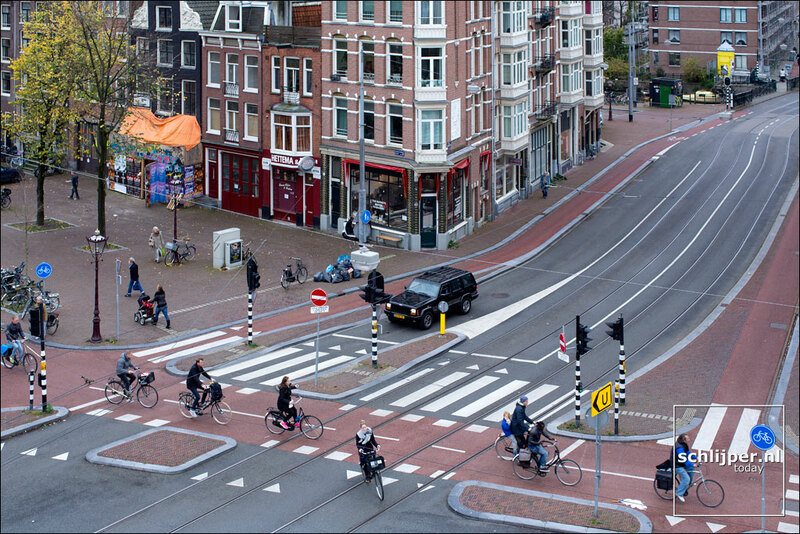 But when there are lots of bars belonging to multiple bike and ped crossings, it gets hard to pick out one from another, like a herd of zebras. The bike crossings might not form a simple square around the intersection like crosswalks do, but may form more complex arrangements, with some closer to the intersection, some further away, and some that don’t even reach the curb (ending at another crossing). So it’s crucial to make each crossing as visually clear as possible. Solid paint would go a long way towards helping drivers disentangle the bike crossings from each other and from the crosswalks. That’s a lot of bars! And this is just a small intersection with a three-way stop. Curiously, “Nebel” is the German word for “fog”. Below is the Millennium Trail (a shared use path) where it crosses Henslowe Drive in Rockville. The crossing is very clearly defined, with red pavement and white lines on each side. The red pavement even has a stamped brick texture, adding to the effect. Visually it looks like a path. I didn’t actually measure the widths (I eyeballed it) but on some crossings the bars appear to be less than 2′ wide. The distance between bars isn’t always constant from bar to bar, as if the road crews eyeballed it. The actual width of the bars isn’t as important as the relative width — i.e. the ratio of gap width to bar width. So I’ll cite ratios here. A lot of drivers exiting the garage will simply see three isolated green rectangles, not a bikeway crossing. The bars are too far apart to define a line. (Update Feb. 2018: Due to grit that’s accumulated in the crossing, one of these bars is very difficult to see at all). Some commercial driveways on Spring are even worse, with just one bar in the path of drivers. So if a floating bar design is to be used, the bars must be close together. Spacing must be 1:1. Spacing of 2:1 or higher completely ruins their effectiveness. The county might also look at changing the bar style. 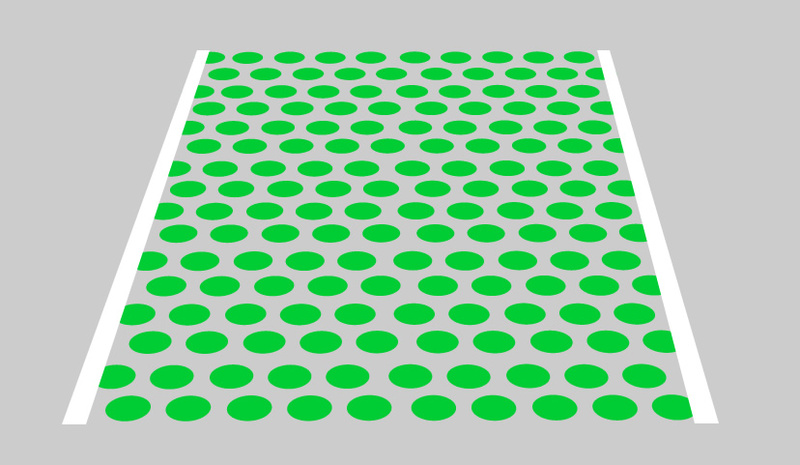 For example, more of each bar could be white – like one or two feet at each end, not just a few inches. 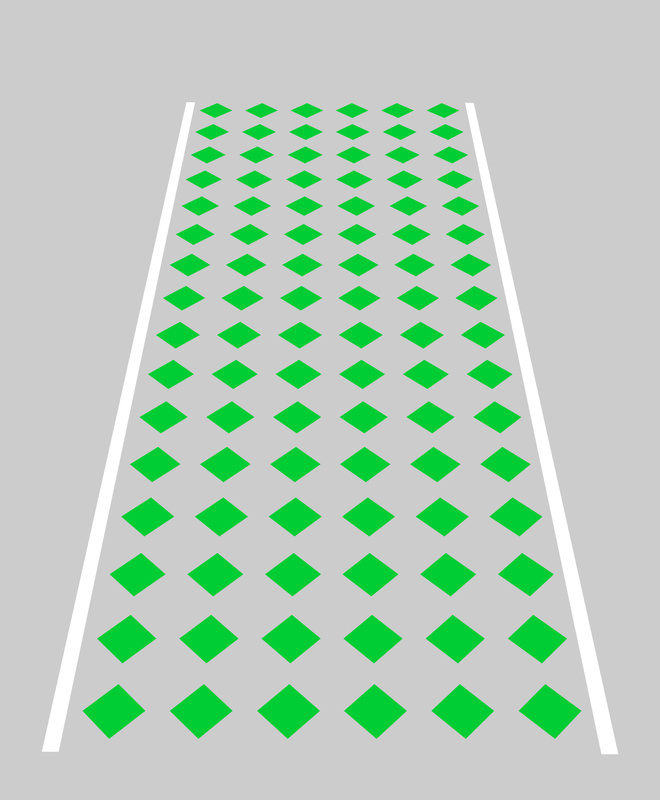 The white ends of the bars would almost resemble the parallel rows of squares in this Dutch example (but with green bars instead of a solid red background). With less green paint per bar, the bars could be brought closer together without adding cost. 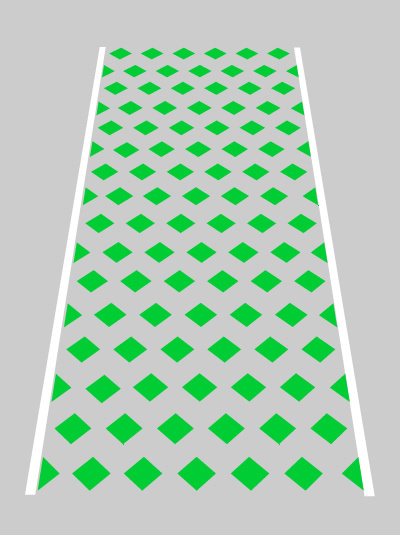 The crossing would look less like a crosswalk, but might be confusing in other ways, so I don’t know if that particular design would help. But my point is that other designs should be explored. They might not alert cyclists to the fact they’re crossing a street or driveway. They could be mistaken for things like bike boxes and queue boxes, which also use solid green paint. They are more expensive to build and maintain. It’s not a problem for me, but I could see where some cyclists might not realize they’re crossing a street when the crossing is solid green without additional cues, especially if the non-crossing portion of the bike lane is also solid green. 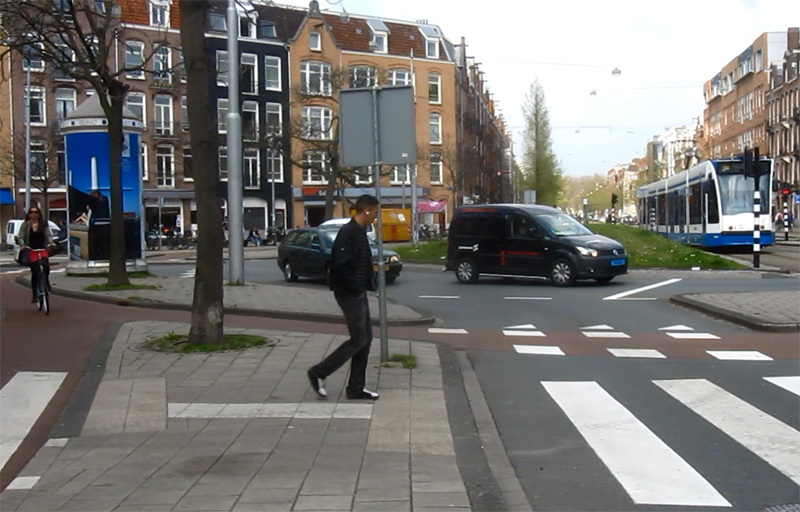 But there are a variety of ways to let cyclists know they’re crossing a street, in particular dashed edge lines to markings alongside the crossing like these in Amsterdam, Vancouver, and our own North Bethesda. Stop signs can be used at some locations. Another solution is the hybrid style of crossing I propose below. 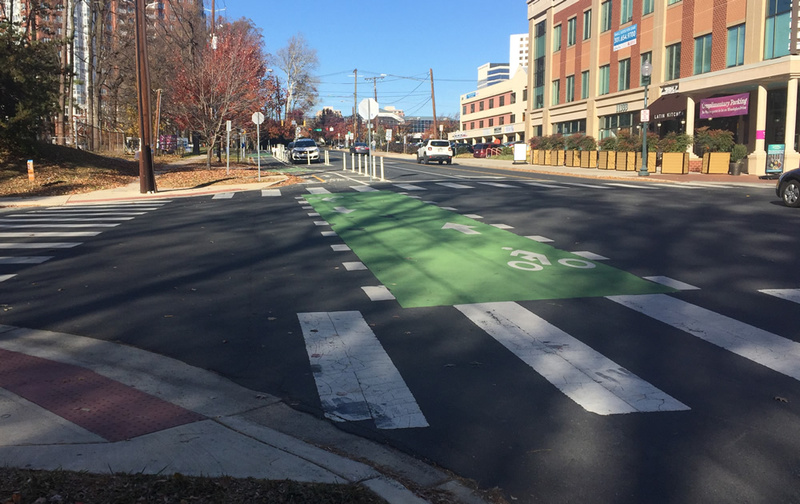 Floating bars may still be appropriate in special contexts, like turn lane crossovers, where drivers might not be sure they can cross the bike lane, justifying a more “porous” appearance. 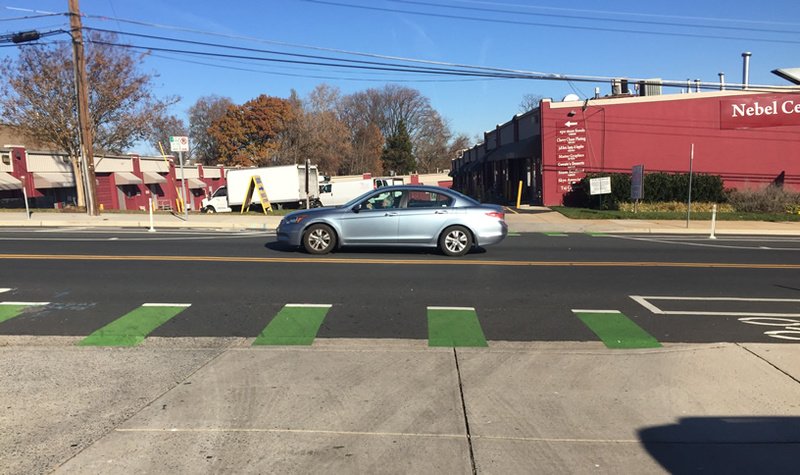 Differentiating solid bike crossings from other uses of solid green paint like bike boxes and queue boxes is an issue as well. Some intersections use quite of bit of solid paint for these elements. Of course these elements may be mistaken for crossings even when the real crossings use floating bars. 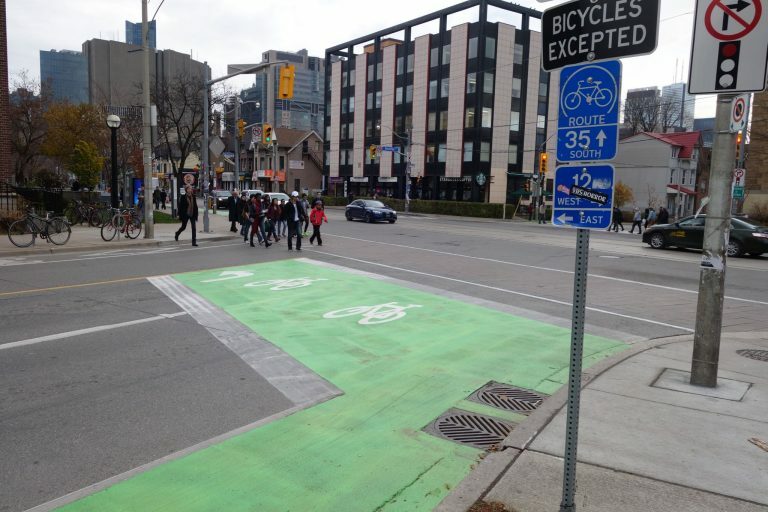 The problem is compounded by bike emblems in bike boxes showing a cyclist (or a little parade of cyclists) riding from right to left, suggesting it’s a perpendicular crossing. Distinguishing between solid areas may come down to using special edge lines or the hybrid crossing style I propose below. Such ergonomic issues have been studied and resolved in countries like Denmark, so solutions using solid paint are possible. Cost is important of course. I believe it’s the single biggest factor driving the push towards floating bar designs. Some arguments for floating bars seem to be rationalizations in service of saving money. Green thermoplastic paint is very expensive. When the paint wears out, barred designs allow for easier replacement of just the worn sections. But at some point the savings do not justify putting cyclists at greater risk. Why provide protected bike lanes at all if we skimp on the protection at intersections, where riders are already less protected? There may however be ways to use somewhat less paint without impacting safety. 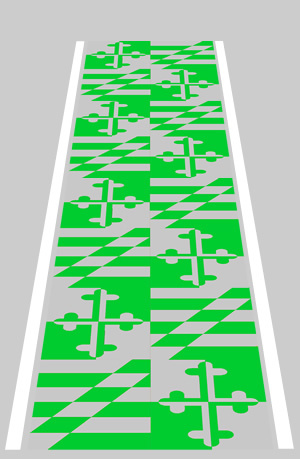 Note that European countries often mix the color into the pavement when the road is surfaced, which is something to consider here. In driver thinking (and designer thinking), dashed lines are okay to cross and solid lines are not. This is a weak argument given the many other uses of solid lines that may be crossed, including older style crosswalks that have edge lines. If anything this argument supports solid crossings, since drivers should think twice (and look carefully) before driving over a bike crossing. Often the drivers are supposed to stop. 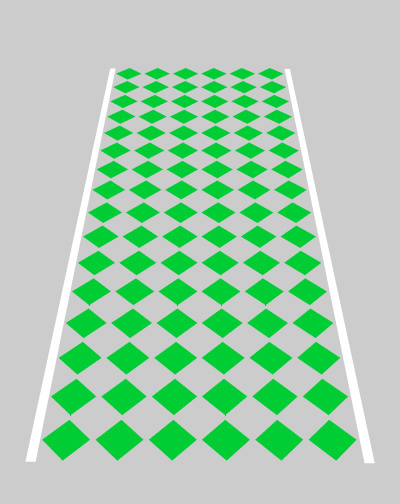 The white lines bordering the crossing can be dashed in any case. 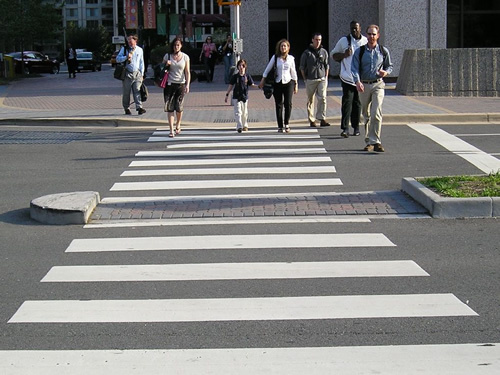 Barred crossings could still be used in certain contexts, such as turn lane crossovers. Foreshortening makes barred crossings appear dense when it matters most, to drivers who approach at higher speeds (i.e. parallel to the crossing, then turning across the crossing). Nevertheless, 2+ ton vehicles approaching from the perpendicular direction are still very dangerous. There’s no such thing as a safe collision, and the vehicle could run over the cyclist or push him into traffic. Drivers pulling out and turning right are particularly hazardous in the case of two-way PBLs and sidepaths, something known to all bikeway designers (but unfortunately not to all cyclists). Moreover, vehicles stopping in the bike lane are quite a nuisance, obstructing the lane. Stripes are more conspicuous than solids. To address concerns about both floating bars and solid crossings while saving paint, I propose what I call a hybrid crossing. It’s neither solid nor striped, but rather consists of a pattern of smaller shapes, like a solid area with a visual (not physical) “texture”. Some might call it a patterned crossing. It would have the perceptual impact of solid paint but would clearly be distinguishable from areas that must be solid, like bike boxes. It also wouldn’t be hard to pick out among pedestrian crosswalks. A surprisingly solid feel can be achieved with just 25% paint coverage, equivalent to the 3:1 bar design (2′ bars and 6′ gaps). Even better is 40% coverage, equivalent to 2′ bars with 3′ gaps. If it works better, the edge lines could be dashed instead of solid. The national consensus on many PBL design issues is far from settled. There is certainly room for local planners to experiment and improvise. I think Montgomery County is in a good position to try innovative solutions like hybrid bike crossings. National consensus seems to be coalescing prematurely around an inferior solution. It only takes a few influential consulting firms to spread such a consensus across the country, creating an environment where cyclists pushing for alternative solutions at the local level face an uphill battle. So the county should act now to try new things.